Technically, declination is the difference between true north and magnetic north. Declination is the term used to indicate that the magnetic north is actually in perpetual motion. This means that magnetic north can be found within a certain range of true north, but it is not a consistent distance from the actual true North Pole. It has been show to drift as far away from the true North Pole by a little over 1,200 miles. It can also drift back, and be less than 200 or 300 miles from true north. By being able to determine the present state and distance of magnetic north from true north, those who rely on compasses to find their way, have to make some angular adjustments. True north is what is used when creating new maps. However, a new map will also have the necessary declination information printed on them for easy reference. This way, the hiker or sailor knows how far off their destination might be, and how they can adjust their course for better destination accuracy. Magnetic north is so flexible, because it comes from the iron based molten core, which is magnetic. True north doesn’t have this flexibility, because it is an actual pinpointed place on land. It is actually the place determined to be the ‘top’ of the world. As you can imagine, there have been many scientific disputes over the centuries to determine the actual placement of the North Pole. 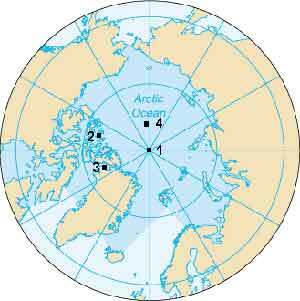 Compasses are based on magnetic information, and therefore track the magnetic north. The programs used to program the ever popular GPS units, don’t operate on magnetic north or true north. Waypoints are determined via satellite, and are actually controlled by regulators. There is an intentional miscalculation of GPS coordinates, that moves on a regular basis, to help prevent destroying the accuracy. Can true north be determined by the stars? Anyone with a significant education in astronomy will find that they will be able to determine the true north, but it’s not as easy as simply finding the North Star. As the planet rotates, the stars seem to move across the sky. This means that one month your favorite constellation is toward the left side of the sky, and another month you’ll find it on the right side of the sky. Despite the difficulty, true north can be determined by the stars, while magnetic north can not. charm. "Difference Between True North and Magnetic North." DifferenceBetween.net. January 30, 2010 < http://www.differencebetween.net/science/difference-between-true-north-and-magnetic-north/ >. Very Nice i like it all except for the last paragraph, As far as i have seen Polaris never really moves, just the rest of the heavens move around it. Find the north star (Polaris) and you’ve pretty much found true north ?? That’s because the earth is not a rotating ball, its stationary and all the constellations revolve round us.they have changed our maps to hide the truth. If the earth is not a ball, then why are the constellations different in the southern hemisphere? Who is the author of “Difference Between True North and Magnetic North” ? I need to cite this correctly for my research paper.